I don't usually re-post things I've previously published on my blog, but I thought I would make an exception for my goat milk mozzarella. This is because I find myself revisiting this post at the beginning of each mozzarella making season. I need to refresh my memory for the amounts of citric acid and rennet. It's a good post with lots of good information, but I'd like it a bit more concise. Hence a heavily revised re-post. Let milk sit in the fridge for at least three days. Back when I was a mozzarella making beginner, I was advised that for mozzarella, at least, goat milk should be at least three days old. This has to do with pH changes that make a more elastic curd (as opposed to crumbles). I can absolutely verify that this is true. Skim the cream and save. You can make whole milk mozzarella, but this is an excellent skim milk cheese. Optional: skim the milk and save the cream for something else. Mozzarella is the one skim milk cheese that I make. Pour milk into the large pot. Mix citric acid in 1/2 cup water, stir well. Pour into the milk through the skimmer. Stir to mix well. Mix the rennet in the 1/4 cup water. Pour it into the milk through the skimmer. Stir to mix well. (To read about the different types of rennet, click here). Allow the pot to sit about 30 minutes, or until the curd forms a "clean break". Clean break is when it can be sliced cleanly with a knife. Cube the curds with a knife and let rest 10 minutes. While the curds are resting, set a kettle of water to boil for stretching the curds. Pour the hot water into the large bowl. With cold water adjust the temperature to about 145 - 150° F (63 - 65° C). Break the curd into small pieces and place in the hot water. With rubber gloves, stretch the curd until it is smooth and glossy. If it begins to get stiff, return to the hot water for several seconds. The heat keeps the cheese soft and pliable. Place in the warm brine. Turn every 15 minutes for a total brine bath of about 2 hours. Drain the brine from the cheese. Wrap the cheese (plastic wrap or baggie) and let sit for several hours in the fridge for the salt to disburse. Enjoy fresh, or grate and freeze for later use. 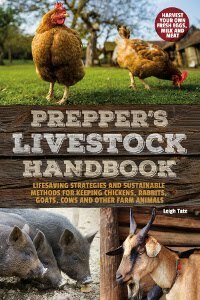 My goal is to make enough for when the goats are dried up before kidding. 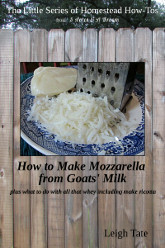 How To Make Mozzarella from Goats' Milk: plus what to do with all that whey including make ricotta is available as an eBook. 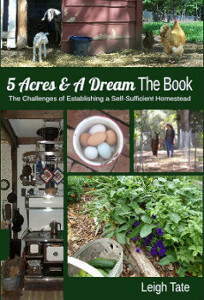 Click here for details and where to buy. P.S. I also have a good amount of milk frozen for soap-making, but still haven't leaned that skill. Wondered if you shared a goat's milk soap recipe at some point (couldn't seem to find one in the archives)? Is this recipe for goat's milk only? We no longer keep goats but have recently met someone who sells raw cow's milk. I had a lot of trouble with a good texture in the beginning, but after I got the information here my texture improved to very few fails. Letting the milk sit for at least 3 days seems to be key, which is supposed to go back to the pH of the milk. It would be interesting to keep detailed records of all that! In addition, all the temperatures here a lower that the recipes for cows milk mozzarella, which may make a difference. Goat milk curd is supposed to be more "fragile" than cow, but I honestly don't know why. Jaime, I'm so glad to know you've had good success! I have not yet done any posts on soap making, but like you, have some in the freezer for that purpose. I'll have to dig out my recipe and get to work! Great post, Leigh. As if there isn't enough to keep me busy during this short summer season of ours, I've had a bee in my bonnet regarding making cheese lately. No access to goat's milk but I do have access to as much raw cow's milk at I need. (If I'm smart (ha! ), I'll wait until fall to jump into the cheese vat though.) That shot of the pizza looks amazingly delicious! Thanks for adding the more precise info to your recipe. As you know, many of us use your posts as guide posts, so any time you can add specifics, the better!. Trouble is, once you get used to good homemade raw milk cheese, the store bought stuff is blah. That's amazing, didn't know it even was posssible! The mozzarella looks really yummy, but unfortunately I have no raw milk available. Charlotte, mozzarella (or any cheese) can be made out of any milk except ultra-pasteurized. The heat from the process alters some of the protein molecules which ruins it for cheese. If you can find regular pasteurized, you're in business! How smooth and creamy does that look, i think you have mastered it. Does the texture change after freezing? Once again you have me wishing for goats in the pasture. One day! Great post and great looking cheese. Sarah, I hope you find them! Yummy! I haven't had goat's cheese ANYTHING in years. But I am lucky enough to have a neighbor with a Jersey cow. The goats are in my future, tho...I have 4 granddaughters begging Papa for Niggi's every weekend! About how much mozzarella do you get from one gallon? And do you have any interesting uses for the whey? Thanks! Super motivated to try this and see how it compares to cows mozzarella.